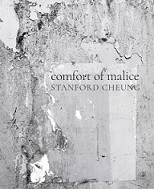 Stanford Cheung is a poet and musician from Toronto who is presently living in Montreal. Brooklyn, NY: Operating System, 2016. 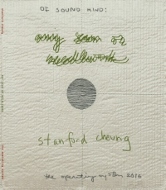 Cover art: Quilt Drawing #12 by Daphne Taylor. Inspired from the folk tune of the English ballad “Scarborough Fair,” where the third line of the stanza adopts the title of the collection, “Any Seam or Needlework” burns fiercely on a canvas to be nothing, yet nothing to be everything. Similar to a bronze gramophone record stuck on replay, each typographic confession sings naked on the podium for more unknown dissections. Though the first glance onto the page may be subtle with their canon at play, we begin to form a literary study on the relationships between the poet’s conscience and the mentality of the poem itself. Some say it’s as if the whole sentence becomes alive with each glance, or what’s worse, an ode to phonetic cult. Comfort of Malice engages with the process of documenting in the evening fields of Bamburgh Park attuned to the sounds of fairgrounds, transmission towers and other curiosities of an environment in migration. Accompanied by JC Bouchard’s photography is a multi-modal experience of the beautiful in conflict with the gritty, a notation against landscape. Structures from the Still is an imperative to recall and forge an internal landscape bound by kites, transmission towers, and the shifting sky — where seemingly unrelated subjects become the very acts of narrative and perception.